Hyundai Verna has ruled the segment for many years since the introduction of the Hyundai Fluidic Verna in India. It has been one of the most attractive and premium car in the segment. It has offered many features which were first in segment and has offered multiple engine and transmission options which were more elaborate than any other competing car, e.g. the diesel automatic variant of the Hyundai Verna Fluidic has been the most affordable diesel automatic in India for long time. But like every product gets aged, the Verna Fluidic also came of age gradually and the competition also picked up with new and facelift version of competing cars like the new City, Rapid, Ciaz to name a few. To give a new life to the Hyundai Verna lineup, Hyundai India has refreshed the Verna and has launched the new 2015 Hyundai Verna which they call the New 4S Fluidic Verna. 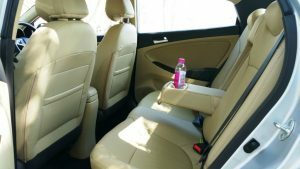 We got an opportunity to spend a day with the car (both petrol and diesel variants) and drove it around Udaipur city and also on highway connecting to Mount Abu in Rajasthan. In this post, we bring you the New 2015 Hyundai Verna Review with complete details that you need to know about this car including exteriors, interiors, features, specifications, engine options, mileage, ride quality, handling, comfort and all you need to know. 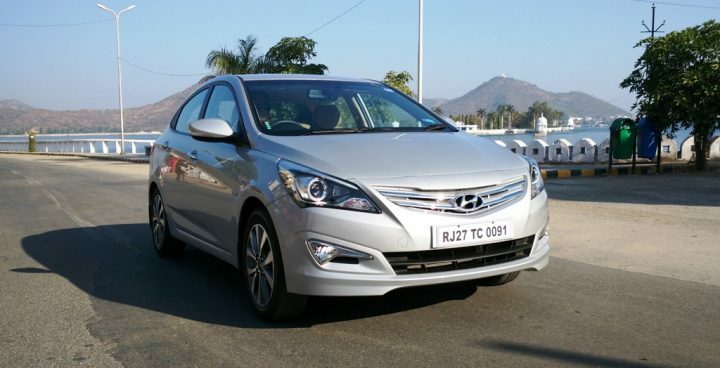 We also bring you the video review of 2015 Hyundai Verna 4S Fluidic to give you a better insight of the car. The new 2015 Hyundai Verna 4S Fluidic model brings in some noticeable changes on the aesthetics compared to the previous version. The new 4S fluidic car has more elegant fluidic design with less curved compared to the previous generation. This is in line with the Fluidic design 2.0 design also seen on the Elite i20. The car looks more elegant and mature when it comes to design. There is still some use of chrome at the front. The front of the car is where you will see most of the changes compared to the ongoing variant. There is subtle use if chrome at the front on the grille. There are large side sweeping projector headlamps with high intensity discharge, the turn indicators have been included in the headlamps cluster. There are also sharp triangular fog lamps on the car and a lower air-dam under the grille. When you move to the side of the car, it looks very familiar as the side profile is very similar to the older Verna. There are new 16 inch diamond cut alloy wheels, subtle wheel-arches and body lines running across the shoulder and the lower side of the doors. The turn indicators have turn indicators built in and the outside door handles are body colored. There is also a micro-antenna towards the rear on the roof which adds to the sporty looks. Move to the rear and elegance continues. There is only subtle use of chrome on the top of the licence plate. The tail lamps sweep to the side and have new flame like design. There are reflectors which are triangular in shape and are at the lower side of the rear bumper. The rear bumper is large and gets a dual tone treatment towards the bottom. Also one more noticeable change is that the exhaust pipe is not visible from rear and has been hidden behind the rear bumper of the 2015 4S Fluidic Verna giving it a concealed classy style. The premium looking beige and black interiors with wood inserts give a classy feel to the cabin. The car is spacious and airy on the inside with lots of space at both front and rear. The boot space is also an impressive 465 litre. However we did miss the rear AC vents which could have made the rear seat a perfect place. 2015 Hyundai Verna offers 4 engine options and 3 transmission options. The petrol motor comes in a 1.4 and 1.6 litre variant with either a 5 speed manual or a 4 speed automatic gearbox while the diesel 4S Fluidic Verna motor offers a 1.4 litre and a 1.6 litre variant with either a 6 speed manual or a 4 speed automatic gearbox. We drove the 1.6 Litre diesel and petrol models with MT and were impressed with both the motors. The diesel car has oodles of torque and power and does not feel out of breath. The torque delivery is very well right from beginning and the VGT does an impressive job and does not give you any noticeable turbo lag. The petrol car on the other hand does not have as much torque, but the power delivery is very linear and throttle response is almost instant. We liked the way it drove in the city. While the petrol car is more fun for the city, for highway drives, diesel model makes more sense as it is more relaxed at cruising and has a lot of mid end punch. 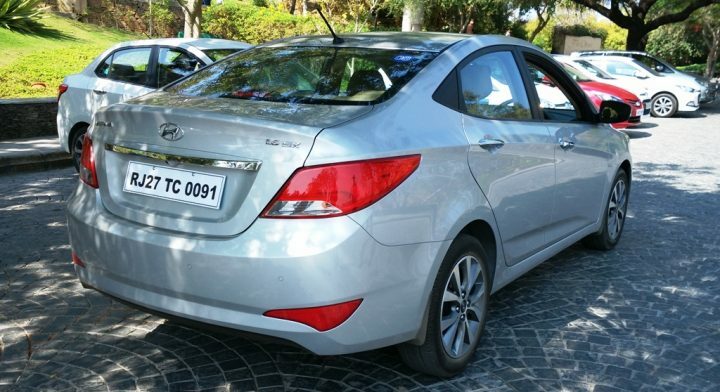 When it comes to ride comfort, Verna has been a comfortable car, in fact so comfortable in the previous generations that the suspension was more biased for ride comfort than handling. But the suspension has been re-tuned on the new 2015 Hyundai Verna 4S Fluidic new model. The rear suspension gets LVC (low velocity return) valve and bump stoppers to improve on the suspension character. We did notice that the car had better suspension tuning compared to the previous generation. It did feel slightly stiffer than before and yet does not go too overboard so as to hurt the ride comfort. 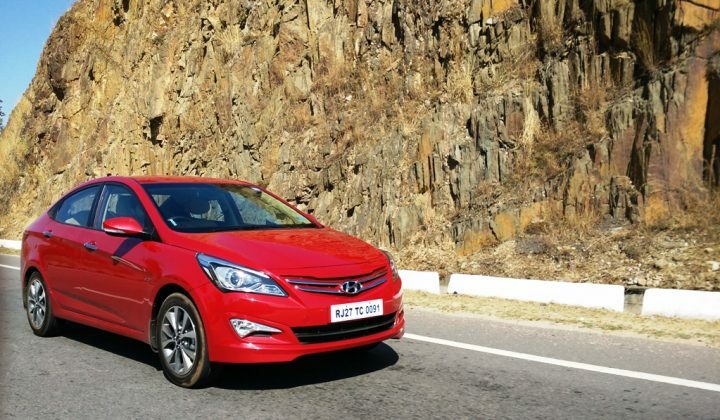 With this change in suspension tuning, the handling is much improved compared to the previous generation of Verna, but it is still slightly on the softer side. The steering also feels heavier at higher speeds, thanks to ECU tuning for steering. While the car handles and behaves very will under 120 KMPH, beyond that it still feels like there is scope for some more improvement. But in most practical situations, you will not find troubles with handling of the new Verna, it is definitely a great improvement over the previous generation. The 2015 Hyundai Verna does live up to its name 4S with sophisticated design, ability to reach high speeds with ease, lots of style statement and safety with features like ABS being standard on the car. The car looks more mature and elegant compared to the previous generation. It does retain the features and premium feel on the inside, it offers oodles of space both in cabin and boot. It gives high performance without compromising on the mileage, the ride quality and handling is also much improved. In totality, the new 4S Fluidic Verna is a great choice for someone looking for a comfortable sedan around Rs. 10 Lakh price segment. For in-city use, we suggest the 1.6 petrol, while for highway commutes, the diesel variant would be a more fun to drive option.